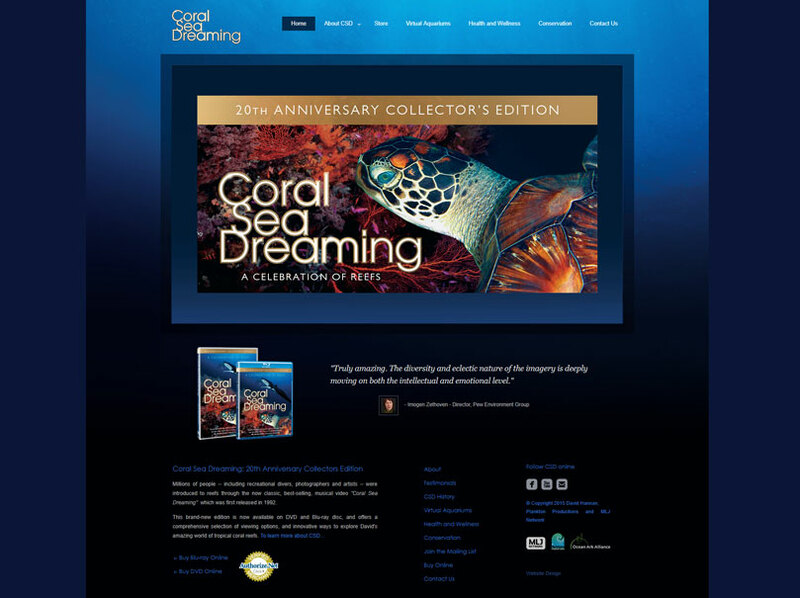 During 2012 Ocean Ark Alliance and Plankton Productions commissioned us to create the Coral Sea Dreaming website and setup the facebook page to assist with the promotion of the Blu-ray and DVD documentary release. The website had to appeal to both a US, international and Australian market. We worked with the Australia and US team mostly via Skype, email and Basecamp. The various features built into the Blu-ray and the DVD. It has many types of very special features. It is much more than just a documentary. We were commissioned to design 3 concepts for the website. The one that was selected was the most conservative of the 3. Under a Non-disclosure Agreement we are not able to show the other 2 concepts. We were also commissioned to setup their Facebook page and provide many types of graphics including website banner ads. You can see one of these below. Looking back at this project brings back so many very fond memories. They have been a long time client and we are honored to be associated. Creating the Coral Sea Dreaming website was a pleasure and something we will never forget. PS. Previously in 2010 the owner of Green Valley Digital (Jay Daniells) was asked to create the Plankton Productions website. That too was an honor and a memorable experience for Jay and the team. Since Jay started setting up our basic websites way back in 2003, the Internet has evolved so quickly and totally it seems a wonder we’ve been able to keep up with our online presence. Apart from always applying impeccable craftsmanship in design and execution, Jay has continuously alerted us to important new developments whilst frequently implementing new techniques. Jay and his team is across the many disciplines of modern websites and online marketing and knows how to develop and apply ‘the right solutions’. As our ongoing lead designer and these days independent web project manager, Jay has over the years introduced many insightful methods to promote and gain results online. I highly recommend Jay Daniells and Green Valley Digital as first port of call in bringing any web project to fruition.